Add to Cart is for USA customer only! A1 Out of Stock - Mature Shuan paper or called Sized Shuan paper (sparkle rice paper) Size is approximately 26"x51". For Detail Style painting. See example painting at right. 1. For up to 10 sheets, choose one of the 1-10 Add to Cart button; for 11 to 20 sheets, choose one of the 11-20 sheet Art to Cart Button. 2. Enter the total number of Shuan papers regardless types. 3. Go on with other orders if you want other things. 4. At check out, after inputting your payment information you see "Add special instructions to the seller" on Review Your Information window bellow your shipping address. Click on Add. 5. At the Add window, write down what type of paper and amount of each you are ordering. When using this paper paint on the sparkling side in order to get the maximum color effect. 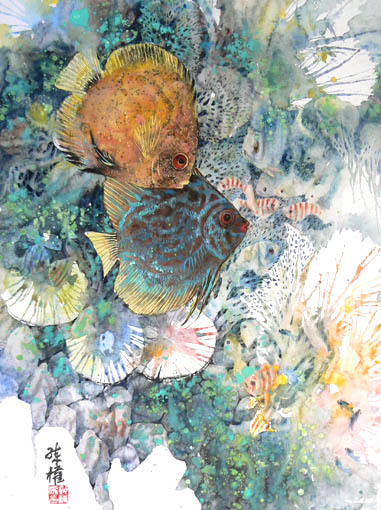 See demos on Lian Zhen's painting demonstration DVD named "Angelfish in the Coral World", click here Book & Painting Demo DVDs. Size is 27"x53". For Spontaneous Style painting. See example painting at right. Both sides of the papers can paint on. 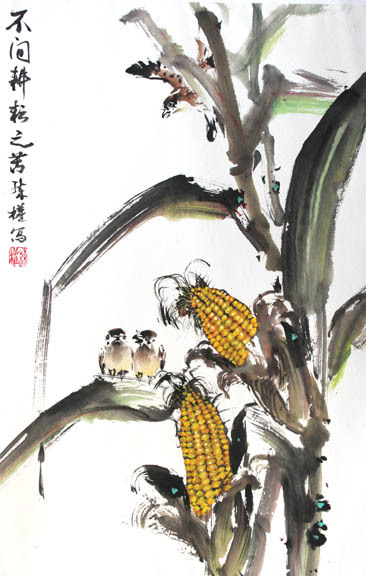 See demos on Lian Zhen's painting demonstration DVD named "Spontaneous Style", click here Book & Painting Demo DVDs. Example painting used the Raw Shuan paper. Brushes shown at right from bottom to top: B1a, B1b, B1c, B1d. Sheep hair brushes are softer than the wolf hair brushes. Brushes shown on the right from bottom to top: B2a, B2b, B2c, B2d. Note: To open the brushes, put their heads in clean cold water for about 10 to 30 minutes until the glue attached the hair diluted into water and the brushes heads become soft. This colors were made of minerals and plants. They are water solvable similar to watercolor. 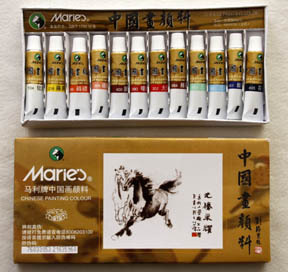 D1 - Small set: 12 tubes in 1/2¨ diameter x 2¨ long, 5ml each tube. $8.00 per set plus $3.00 shipping to US address. D2 - Large set:12 tubes in 1 ½" diameter x 3" long, 12ml each tube. $16.00 per set plus $6.00 shipping to US address. 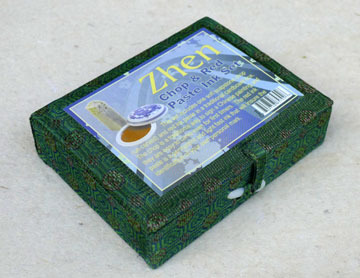 E1 - Zhen Chop set: $58.00 plus $6.00 shipping to US address. 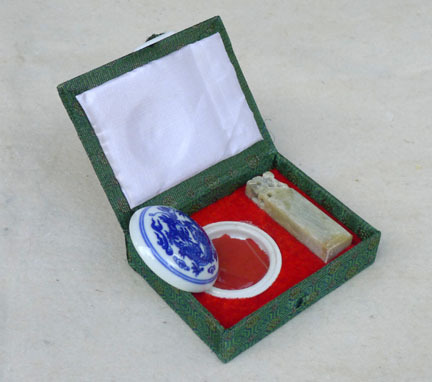 Chop size: 1 1/4" square by 3 3/4" long, soap stone with carving at end. Rouge dish: 2 1/4" round. 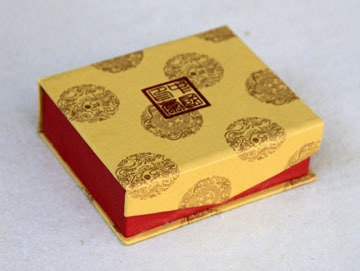 Box size: 4 1/2" W 3 1/2" D x 1 1/3" H.
E2 - Golden Chop set: $58.00 plus $6.00 shipping to US address. Chop size: 1 1/4" square by 2 1/2" long, soap stone. 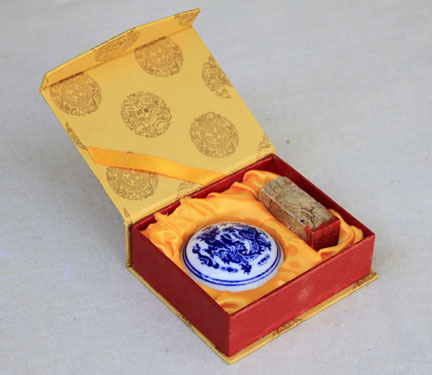 Box size: 4 1/2" W 3 3/4" D x 1 1/2" H.
Your name will be phonetically translated (or your choice of meaning translated) into 2 or 3 Chinese characters and then carved on the chop in ancient Chinese written style. 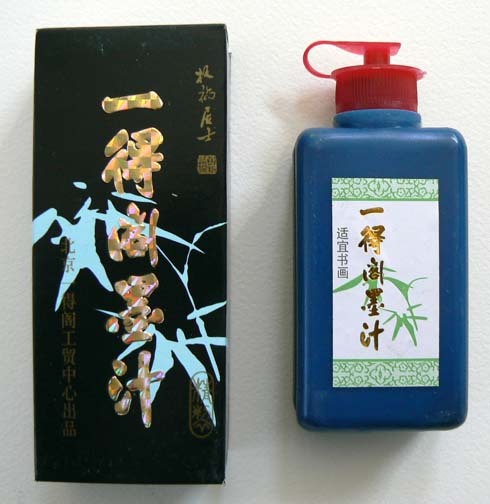 Four brushes from small to extra size (see picture on right), 2 single layer raw Shuan papers, 1 mature (sized) Shuan paper, 1 box of the small set color with 12 tubes as and one bottle of ink (the small set color and the ink are shown on the pictures above at right). Price: $43.00 plus $15.00 shipping to US address. 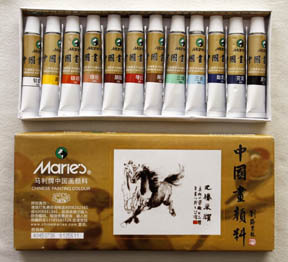 Students who are taking Lian's Chinese painting lessons can purchase the kit in his workshops for $35.00. International order: see detail below. International order and payment: Please email your order to lianzhen@yahoo.com for and total price quote. Pay with Visa, Master and Americanexpress cards: email to lianzhen@yahoo.com to provide your card information (account number, expiration date and code). Pay with Paypal: from your Paypal account, click on the Send Money button and then follow the instructions to make payment to Lian Zhen's Paypal account: lianzhen@yahoo.com. Indicate what you order, your email address and mailing address. If you do not have a Paypal account but want to create one, go to www.paypal.com. This is one of the safe ways of making payments online. Upon receiving your payment, your order shipped within in approximately two business days.